DRM-free ebooks and music in pay-what-you-want bundles! The success of DRM-free bundles has been a powerful counterargument to the claim that Digital Restrictions Management is necessary for sustainable digital publishing. These bundles are forming around music and literature, and really showcase being DRM-free as a major selling point. 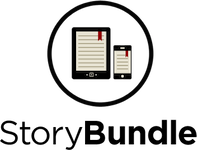 Now, the Big Bang Bundle by StoryBundle has just launched, and the Humble Music Bundle has just a couple hours to go! Both of these are pay-what-you-want bundles that allow you to choose how much money goes to the artist, to the bundle, and to the charity they are benefiting. This is StoryBundle's first promo, and it's already off to a great start. It is a bundle of five ebooks, plus two bonus books if you pay $7 or more. The ebooks will be readable on whatever device you prefer, and they are DRM-free which means you have full control over your files and you actually own what you buy! The Humble Indie Bundle team has completed several bundles, and with this new music bundle, they are offering downloads in FLAC (the free lossless audio codec). Their success has inspired many other DRM-free bundles such as StoryBundle to organize, and we look forward to the continued success of DRM-free bundles of ebooks, music, and even video and other arts. These offers are for a limited time, so hurry and show your support for DRM-free works!